Whether you are serving brunch, lunch or dinner, these five Easter recipes are the perfect addition to your table this holiday. Instead of working extra hours in the kitchen, enjoy the Easter egg hunt and take pictures of the kids discovering their baskets. You can make these Braised Lamb Shanks in Red Wine in the slow cooker before festivities get underway, so you can enjoy the fun with everyone else. Serve the rich shanks over mashed potatoes or polenta for a special holiday dinner. If you’re sitting down for a meal on Easter, asparagus will likely make an appearance on the table. Blue cheese vinaigrette, toasted walnuts and fresh dill top this asparagus to deepen the flavor profile and make it a memorable side dish. Roasted Asparagus Salad with Blue Cheese Vinaigrette is a nice accompaniment to ham, steak or lamb, or you could enjoy it as a standalone lunch. This cold pea soup is a refreshing twist on a classic. Spring Pea Soup is lightened up with brighter ingredients like vibrant herbs, zesty lemon and tangy Greek yogurt. The spring pea, determined not to be taken for granted, shines in this soup that will be the perfect addition to your Easter lunch menu. 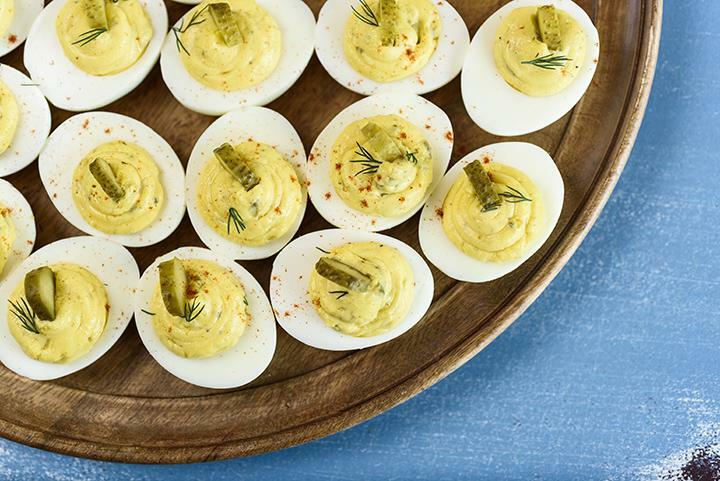 Deviled eggs are an Easter must-have. While Classic deviled eggs are a no-fail favorite, why not jazz up your favorite recipe by adding something no one will complain about – cheese. We mixed pimento cheese with the egg yolks for a cheesy twist on the standard deviled egg. Top each Pimento Cheese Deviled Egg with a small slice of crispy bacon to assure your guests come back for seconds. Just incase your guests didn’t get their sugar fix from all of the Easter egg candy, serve Carrot Cake for dessert this Easter. This carrot cake is simply delectable, and since it’s made with two cups of shredded carrots, it at least seems healthy, right? The tartness of the cream cheese frosting brings it all together, making one sweet, crunchy, moist delicious cake. Serve it with coffee to end your Easter meal. Summertime is party time. Whether you’re hosting a Labour Day barbecue for extended family or are inviting all the kids’ friends over to celebrate an endless summer, we all have a full calendar this time of year. 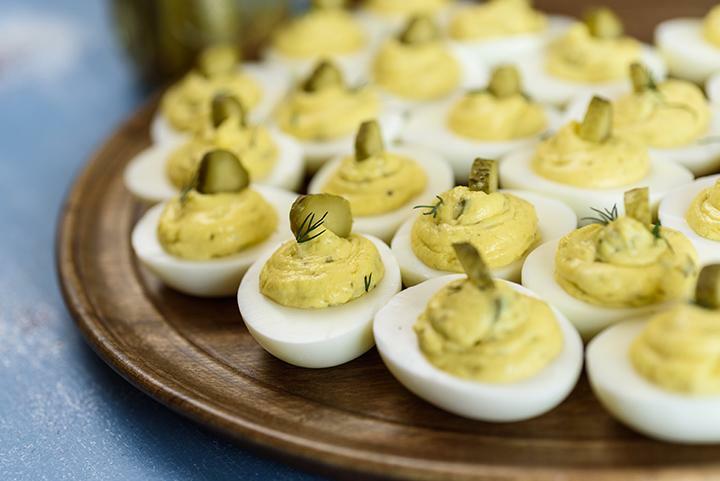 When planning for summer soirees, make sure you put homemade deviled eggs on the menu. Deviled eggs are always a crowd pleaser. Whether you are making your grandmother’s no-frills recipe or adding mix-ins like bacon, jalapeños, or smoked salmon, this egg-cellent app will fly off the table. Pimento cheese is good on (or in) just about everything – and deviled eggs are no exception. In the United States, it’s not surprising to see this delicious spread mixed into egg yolks for a cheesy twist on the standard deviled egg. Top them with crispy, crumbled bacon and a little fresh dill for a next-level appetizer. If you already have plenty of avocados in your kitchen for avocado toast and smoothies, try adding them to your deviled eggs. Top each avocado deviled egg – or Green Devil as they are sometimes called – with salsa and a sprig of cilantro. Serve them on Cinco de Mayo, gameday, or at summer potlucks. If you’re a pickle lover then this recipe is for you. Have you ever added sweet relish to your deviled eggs? Try adding tangy dill pickles instead and see which version you like more. We topped these dill pickle deviled eggs with even more pickles (we found that baby dills work best for garnishing purposes), for a tangy treat that belongs on the buffet table year round. “If it’s not broken, don’t fix it” holds true for this classic deviled egg recipe. You’ll find this creamy, protein-packed appetizer on Easter Sunday tables, at backyard barbecues, and family reunions alike. 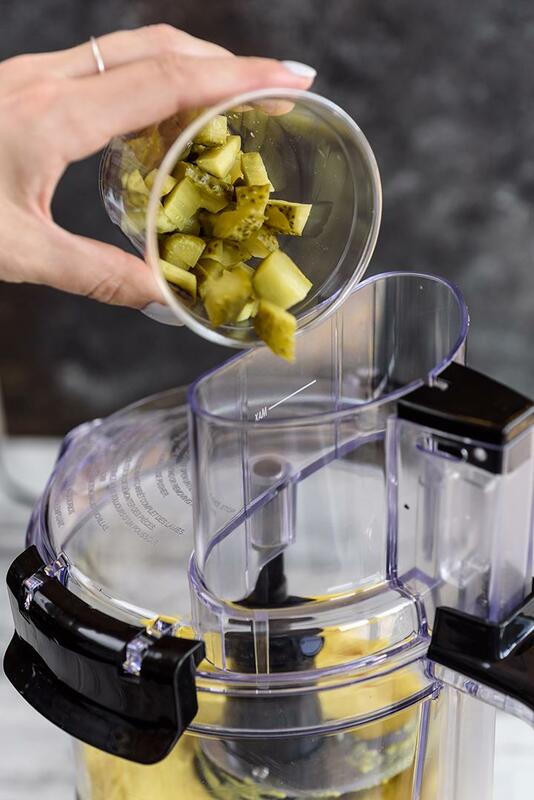 Use your Hamilton Beach® food processor and egg cooker to perfect this go-to appetizer. 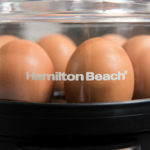 Since the recipe calls for a dozen hard-boiled eggs, I plugged in my Hamilton Beach® Egg Cooker. It perfectly hard-boiled eggs each and every time. And the Egg Cooker allows me to keep the stove off – which is especially appreciated this time of the year when the AC is working overtime. 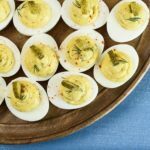 Whether your neighbours are piling them on their Labor Day cookout plates or your gameday houseguests are enjoying them alongside buffalo chicken dip and wings, these dill pickle deviled eggs make an egg-cellent appetizer recipe year round. Pipe yolk mixture into each egg white half. Garnish with dill pickle slices, fresh dill and paprika. If you’ve boiled eggs on the stovetop, you know it can be difficult to achieve the consistency you want. Whether you like soft, medium, or hard boiled eggs, timing is everything. 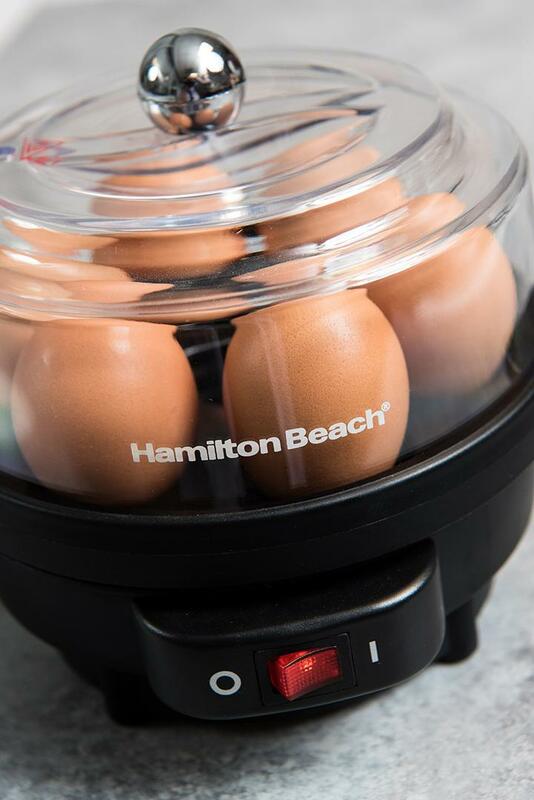 With the Hamilton Beach® Egg Cooker, you won’t have to worry about over or under cooking your eggs ever again. This little appliance (seriously, it takes up very little room) eliminates the guesswork and perfectly cooks eggs each and every time. Whether you want soft, medium, hard, or even poached eggs – the work is done for you. All you have to do is read the side of the measuring cup (that comes with the egg cooker) and fill to the marked line with cold water. The designated fill-line will vary depending on your desired consistency and the number of eggs you are cooking. Pour the water into the reservoir then cover with the lid and press the ON switch. The appliance will sound when the eggs are cooked and all the water has evaporated. It’s just that easy. This little appliance gets a workout in my kitchen year-round, but I find it especially useful in the springtime. With Easter approaching, this egg cooker makes easy work out of whipping together your famous deviled eggs, egg salad, or salad nicoise. If you’re not planning an Easter feast, the Egg Cooker is a great tool for meal prep any time of year. I hard boil 6 eggs over the weekend and store them in the refrigerator to throw into salads, peel for a quick protein-packed snack or for a no-brainer breakfast during the week. Now that the Egg Cooker has erased the hassle from boiling eggs, you’ll find excuses to use it over and over again. The Egg Cooker can also help you make perfectly poached eggs, too. Watch the video to see this amazing little egg cooker in action. Shakshuka is a popular dish in the Middle East and North Africa. 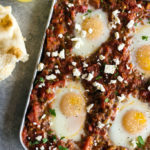 It consists of poached eggs in a spicy tomato sauce usually served with bread for dipping. Overseas it’s enjoyed for breakfast, but it could definitely make for a delicious breakfast-for-dinner option. Who doesn’t love breakfast for dinner? We cooked this sheet pan shakshuka in the Hamilton Beach Easy Reach Toaster Oven. The toaster oven version makes a lovely breakfast for two, but feel free to make it in the oven on a standard baking sheet if you’re feeding the family. In a large skillet over medium-high, heat oil and add onion and one large Anaheim chile pepper. Cook until tender then stir in garlic, cumin, salt, paprika, and black pepper. Then add tomatoes and Hatch chiles and cook until the mixture reduces and thickens. Transfer the mixture to the baking sheet and make four wells (we used a spoon) for the eggs. Carefully crack the eggs into the wells and bake for about 10 minutes at 375 degrees – until the eggs are just set. You’ll want a runny yolk so it can mix with the spicy tomato sauce. We topped our shakshuka with feta cheese and a sprinkle of parsley. And be sure to serve it with plenty of warm naan for dipping – you won’t want to leave a bit of this dish behind. Transfer mixture to a baking pan. Make 4 wells in the tomato mixture for the eggs. Carefully crack eggs into wells. Heat oven to 375°F. Bake until eggs are just set, about 10 minutes. Sprinkle with feta and parsley before serving.